Sometimes you need to travel to far-away lands! 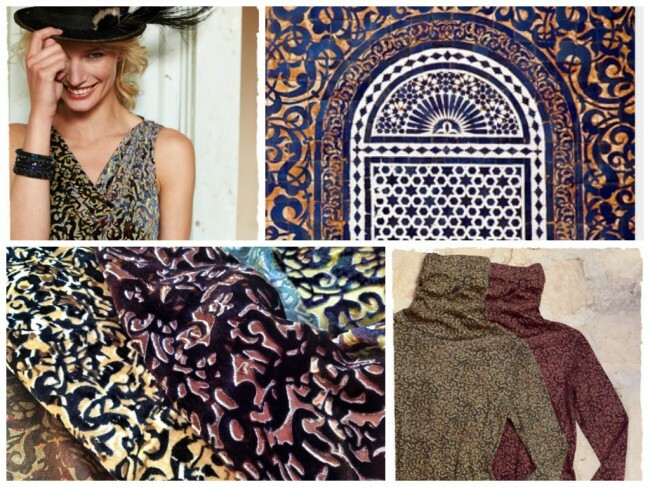 The ornate stylized designs in Morocco have inspired countless patterns here at Peruvian Connection. In our Holiday collection, we were especially thrilled about this fanciful Moroccan scrollwork painted on ceramic tiles. We colored it and played with different fabrics ranging from printed jerseys to velveteen and devoré—and then re-colored it some more! Other times you need a little fancy paper! 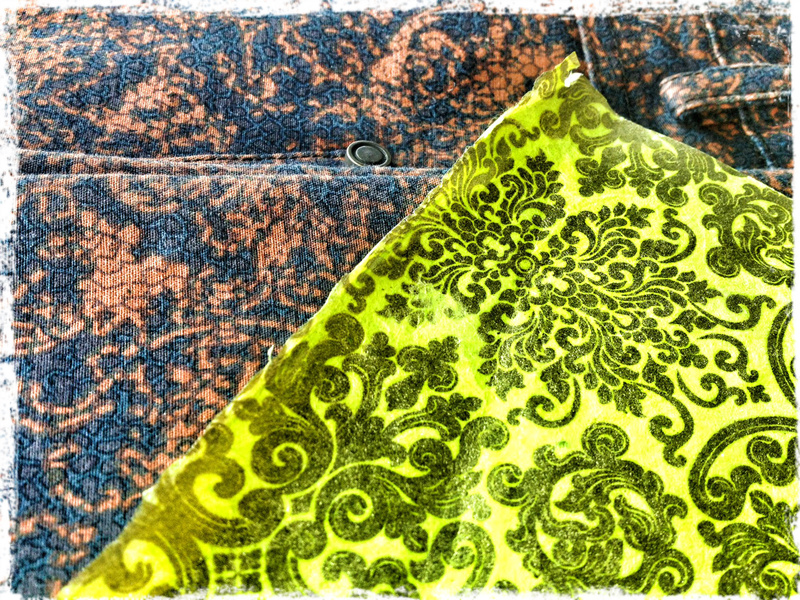 For these lacy-print pants, we started with a pattern inspired by this lavish gold-leaf paper, then “ate away” at the print for an abstracted, decayed lace look. We loved this print on the Paloma Pants so much that we reinvented it on the bohemian Bolinas Skirt. Then sometimes time-travel is the only way! 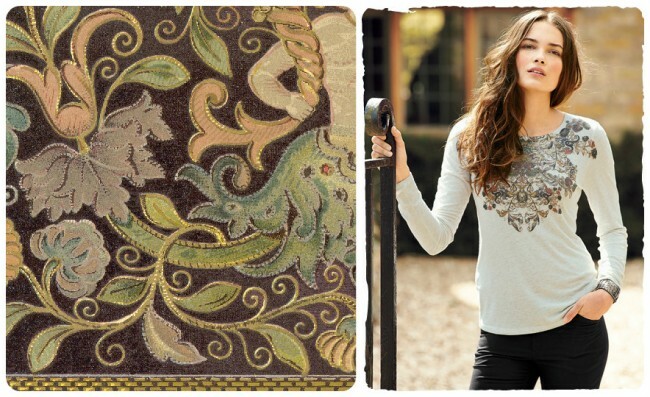 For our Antique Scrolls Tee, we drew from the ornate aesthetic found in 18th century Romanticism. We gave it a contemporary look by making it more graphic and using rich jewel-tone coloring. And sometimes all you need is to look out the back door! If you didn’t know by now, the Peruvian Connection headquarters sit on a gorgeous landscaped farm, complete with chickens and all! 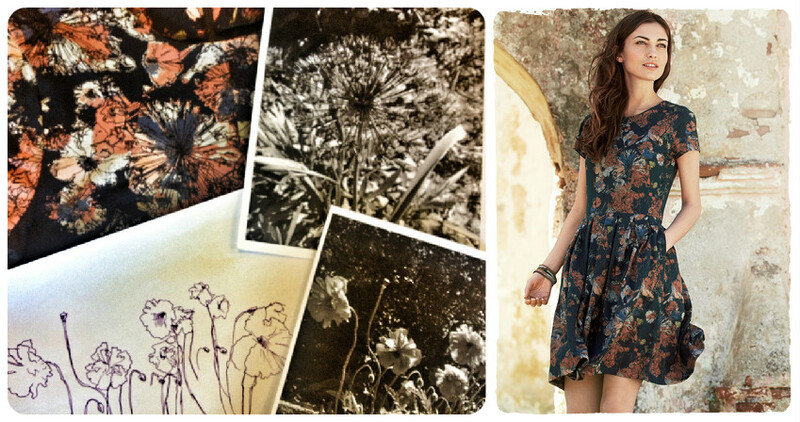 The print on our Sketchbook Dress was created from images and drawings of garden flowers in our very own back yard. Then we layered on washes of watercolor to bring you this artsy, close-to-home print! All Hallows Day in America may be overshadowed by costumes, trick-or-treating and jack o’ lanterns the night before, but let’s not forget why zombies and ghosts fill the streets on Halloween. Celebrated on November 1st, this Christian ritual, also known as All Saints Day, honors those who have attained saintliness in heaven. The following day, known as All Souls Day, commemorates the departed who have yet to reach heaven and remain trapped in purgatory. When the Spaniards arrived in Peru in the 16th century, they brought these rituals with them. The Incas always maintained a strong connection with their deceased ancestors, offering them gifts and requesting assistance, so the ideas behind All Saints Day and All Souls Day were easily absorbed. To this day, the Peruvian celebration of these rituals, known as Dia de los Difuntos, “Day of the Deceased,” focuses on departed ancestors and their indelible connection to those living on earth. 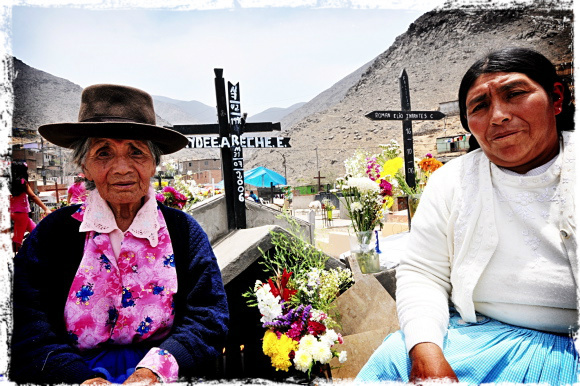 In Peru, the celebration is rooted in the belief that the souls of deceased relatives visit earth on this day. It is the family’s duty to ensure that plenty of food is available for these departed souls in order to fuel their journey in the afterlife. In more rural areas, families may share their meal on the grave of the deceased relative and leave some behind, while in other areas, families will simply bring food or flowers to the grave. Either way, lively music is likely to fill the air, along with the smells of roasted pig, the most traditional food to enjoy on Dia de los Difuntos. 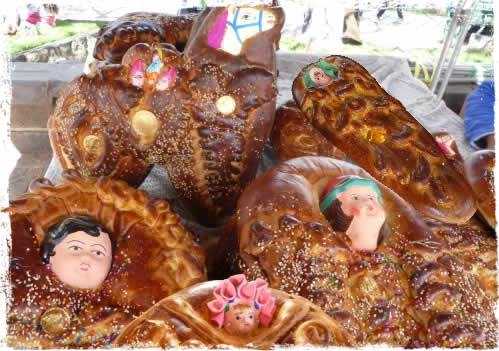 In addition to the roast pig, you’ll likely find “bread babies,” or Tanta Wawas, filling gravesites, decorating the dinner table and entertaining children. Tanta Wawas are made from a brioche-like dough usually in the shape of a baby, to signify the beginning of the life cycle. It’s common in some regions to find horse-shaped Wawas or even staircases, both of which are meant to assist an ancestor in their journey from earth to the other realm. 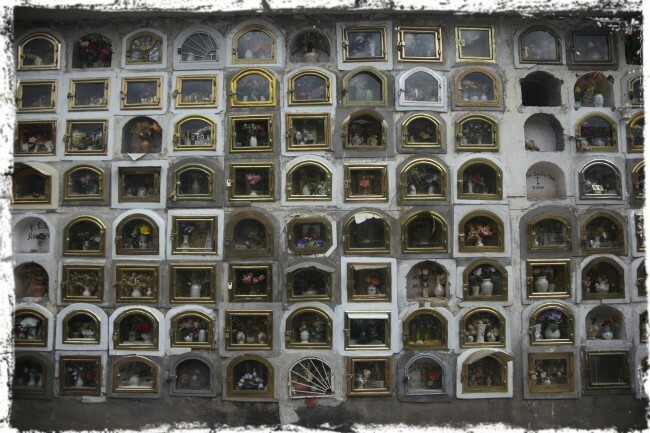 Since the focus is on remembering the dead as they were when living, Peruvian graves are a live “scrapbook” of the deceased. 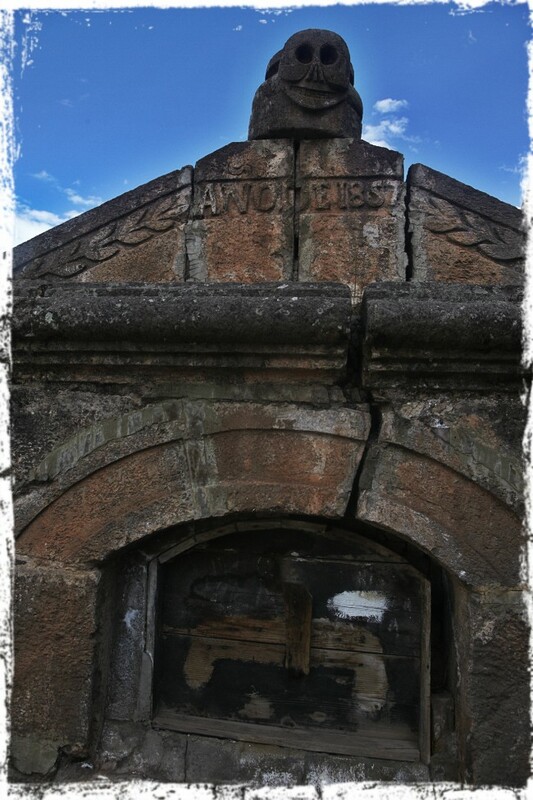 Often, the grave will be gifted with the favorite food or drink of the deceased–it’s not uncommon to spot a beer, a soda or even a bottle of pisco inside the framed glass enclosures that mark an individual’s grave in Peru. These glass enclosures are a window into the life of the deceased. Even as a stranger from another country, you can get the sense of how someone lived, what they liked and who they were from the meaningful display in front of their grave. 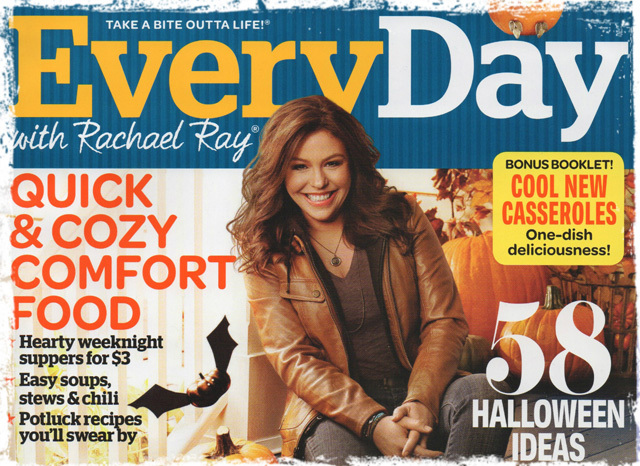 Rachael Ray wearing our Cheval Pendant on the October cover of EveryDay. Peruvian Connection got a kickstart back in 1979 thanks to an article in the New York Times style section…we’ve been big believers in the power of the press ever since. PC has been in the news lately, with mentions in a number of popular blogs as well as in print features. The latest edition of KC Magazine, features an interview with our founder, Annie Hurlbut, telling the story of PC’s roots on the family farm in Tonganoxie, Kansas. 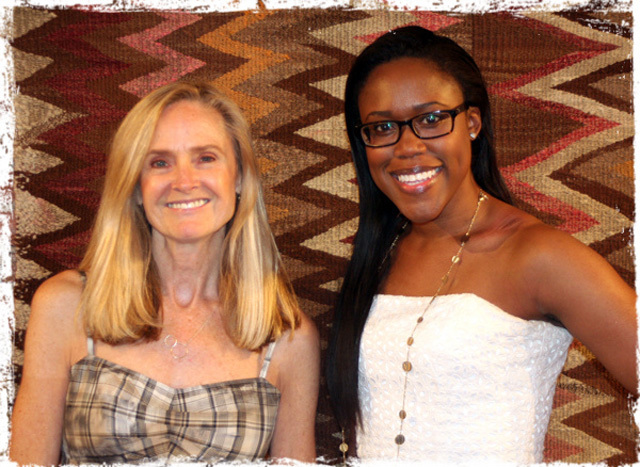 Annie Hurlbut with Georgina of “Notes on Lifestyle by Georgina”. Jonelle of Jo Traveler has been a PC customer and follower for 15 years, and made the trip to Kansas to visit our headquarters in September. LiquidHip, an alternative review site that covers the cool, new and artistic, gives Peruvian Connection and its Art Knits a 9.5 on their Liquid Hip Richter Scale. Renata of Scorpion / Disco in PC’s Bella Lace Pullover and Ayaviri Dress. 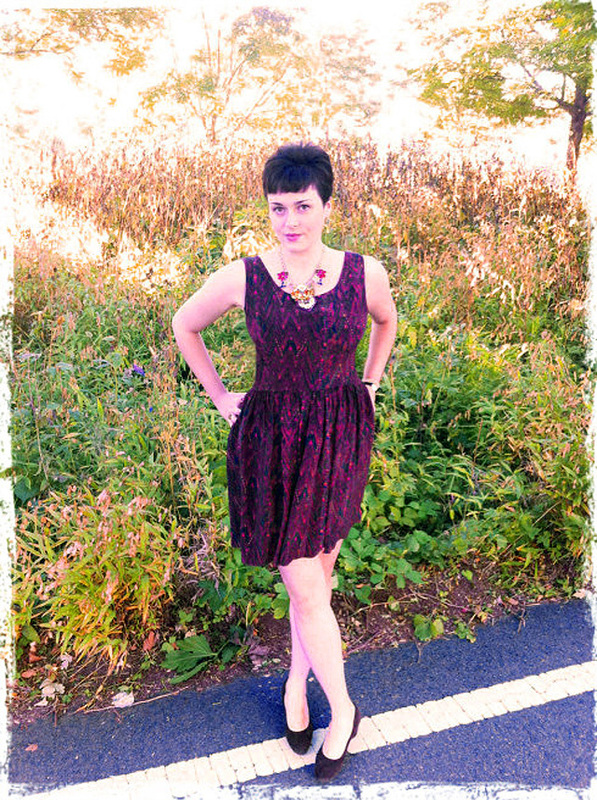 Kacy of “The Height of Style” in PC’s Lucia Silk Pinafore. 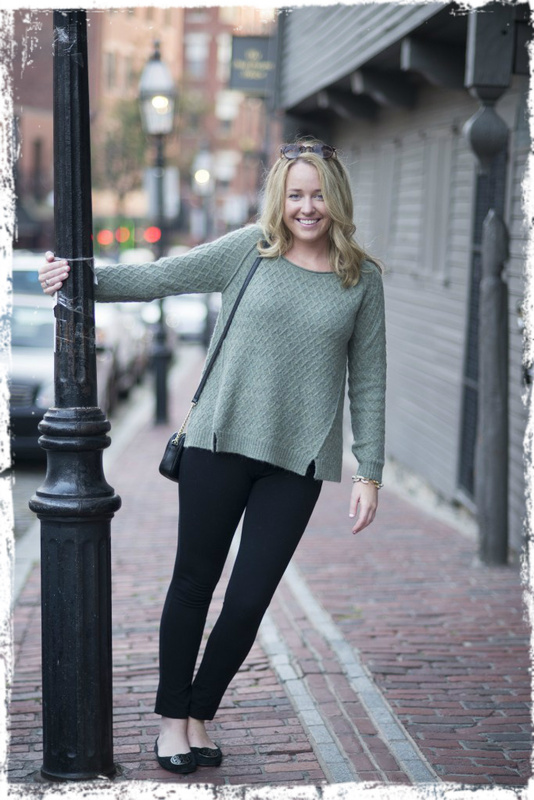 Kelsey of “Tickle Me Pink” in our Inlet Pullover. Jen of “Red Soles & Red Wine”, in PC’s Bedouin Knit Coat. 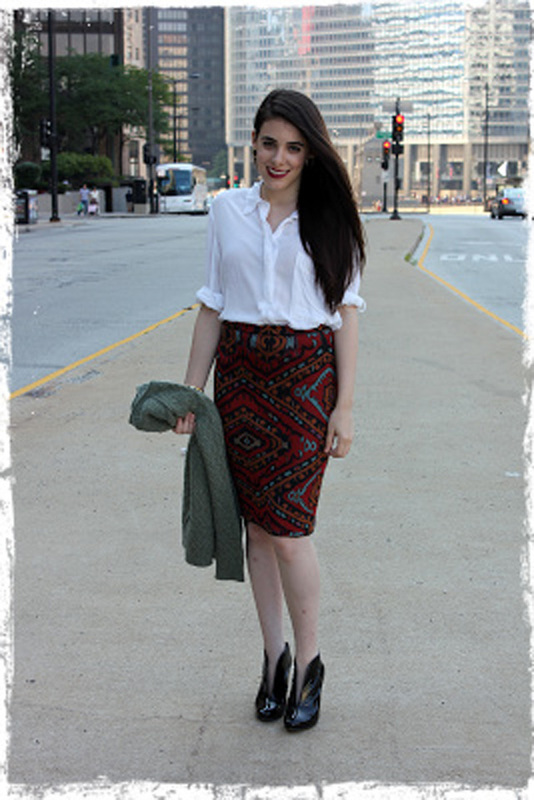 Jill of “Jess & Jill” in our Macedonia Pencil Skirt. Look for features coming up soon in EveryDay with Rachael Ray, Women’s Health and Good Housekeeping! ‘Tis the season to layer-up, but that doesn’t mean you have to bury your fashion sense under a frumpy, unflattering coat. We put together an easy guide to help you find the right winter topper to flatter your shape. To make a sweet deal even sweeter, take advantage of our $25 rebate towards the tailor of your choice! Then fit-and-flare shapes are your best bet. Look for styles that slim through the bodice and flare out through the hips, like our Mireille Maxi Coat. These concealing shapes give you the room you need without compromising your smallness up top. Another trick to balance out wider-on-bottom shapes is to add volume up top, with details like wide lapels, big fancy buttons, breast pockets and double-breasted plackets. Don’t forget to look for coats that hit below the hips! Check out our Belgravia Trench and Black Forest Wrap Coat, they add volume up top, cinch the waist and A-line past the hips for a flattering fit. Then A-lined, looser-waisted coats are for you! Think Car Coats and Cocoon Coats. Their boxier shapes help conceal wider middles, giving you the extra space without sacrificing a great fit everywhere else. Silhouettes that A-line from the shoulder really help showcase your smaller frame up-top. Check out some of our best Car Coats: the Excursion Coat and the Hamburg Coat. What’s more, these coats are the most flattering length for your shape—past the hips. To keep attention off the middle, you don’t want a coat that hits right there. And let’s not forget our vintage-looking Cocoon Coat, it tapers in slightly at the bottom, to help keep those hips looking slim. 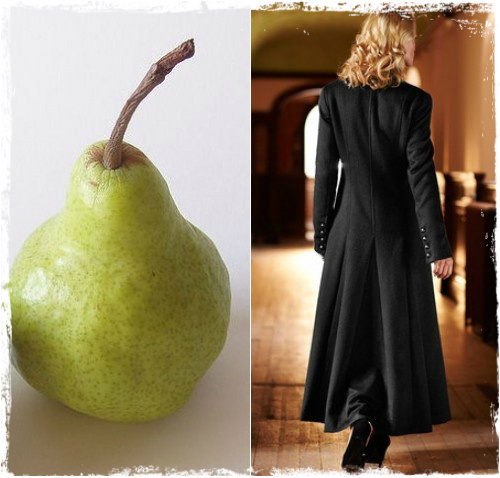 Then shapely waist-cinched coats are the way to go! Look for something with a waist seam or even a belt to show off your small waist (like our Black Forest Wrap Coat and Belgravia Trench). Long coats shouldn’t be ruled out (as long as you’re not petite! ), but for the most part above-the-knee shapes will most greatly flatter curves without hiding them. Styles like our Swallowtail Coat that have a tailored, fitted bodice and an A-lined hem accentuate all the right spots without overemphasizing those curves. Then seek out curve-creating styles. Seamed bodices, double-breasted plackets, peplums, defined waists and pleats are all your friends! You want shapely details, not fill-you-out bulkiness. Fit-and-flare shapes with a nipped-in waist will give you a curvy look without the bulk. 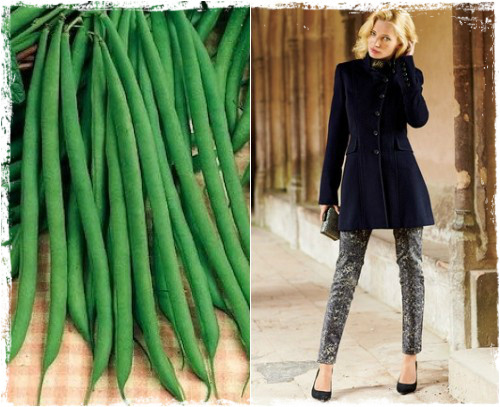 Unless you’re petite, longer lengths can also work for you. Check out our ankle-grazing Mireille Maxi Coat and Rivoli Coat. Let’s not forget defined shoulders! We’re not talking jumbo 80’s puff shoulders, but slight padding, epaulets, or even seaming create even more shape up top. 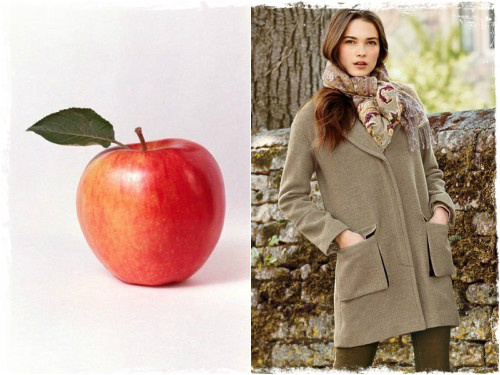 Our Swallowtail Coat has everything you need to create flattering shape while maintaining that slim, tailored look. Then look for coats that don’t put the focus on your chest—opt for details at the neck or hem and avoid big pockets at the bust. Coats that A-line from the shoulder can help balance things out by bringing more volume to the bottom without putting more on top. 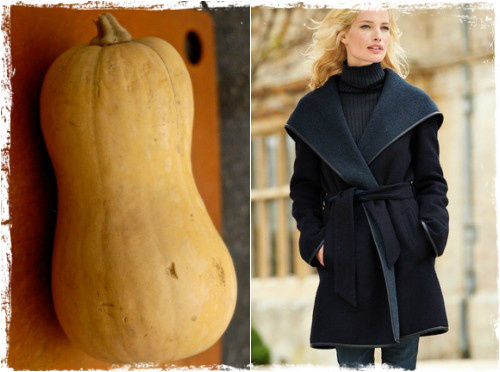 Our Excursion Coat does just that, plus it has a zipper so you won’t have to worry about the gaping-button syndrome! Not that buttons are a bad thing. For the most part, a single-breasted placket will be the most flattering, as double-breasted plackets tend to emphasize the bust. 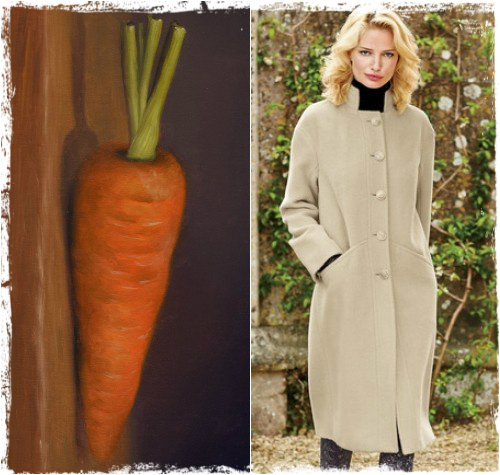 Long lengths help draw the eye downwards, so go for coats that are hip-length or longer. 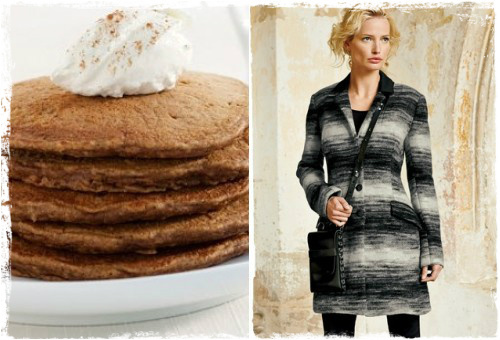 We recommend the Cocoon Coat or the Black Forest Wrap Coat! The Cityscape Shawl, artfully knotted over the Borealis Pullover. There are at least as many ways to tie a scarf as there are days in a month, and judging from the popularity of scarf tying on Pinterest, they’re hotter than ever. There’s the waterfall, European loop, double rainbow, mira, infinity, boa, vintage housewife, and the list goes on. Scarves are the perfect transitional accessory for this October weather when it isn’t really cold, but not quite balmy either, adding a touch of warmth, color and a boho vibe. There are a dozens of tutorials and how-to pages on YouTube- with more than 20 million views and clever editing, this one will get you up to speed on the latest and greatest in under 5 minutes: 25 Ways to Wear a Scarf in 4.5 Minutes! Hermès, famous for their fabulously luxe silk scarves, even has a scarf tying app, Silk Knots. If you splurge on an iconic Hermès scarf, you will receive set of scarf knotting cards, with 21 Ways to Tie an Hermès Scarf. For scarves of alpaca, silk, wool, mohair and super-soft blends, see our Fall/Holiday scarves.